Until recently, Sharp’s $3500 PN-K321 was about as affordable as 4K desktop monitors got. But with the $649 PB287Q, Asus joins a handful of companies making UltraHD desktop monitors affordable to consumers. But are the applications, hardware and operating systems we’re using today ready to make the leap? We looked at Asus’s just-released UltraHD monitor and found mixed results. The 28-inch Asus PB287Q has an impressive list of features: 3840 by 2160 pixel resolution, LED backlighting, two HDMI 1.4 ports, a single DisplayPort 1.2, a bright 330 cd/m2 luminance rating, and 1 millisecond gray-to-gray response time. It offers picture-in-picture as well as picture-by-picture support, a highly flexible stand with height adjustment, pivot, swivel, and tilt capabilities, MHL support, and built-in 2W speakers that don’t sound too bad for built-in 2W speakers. 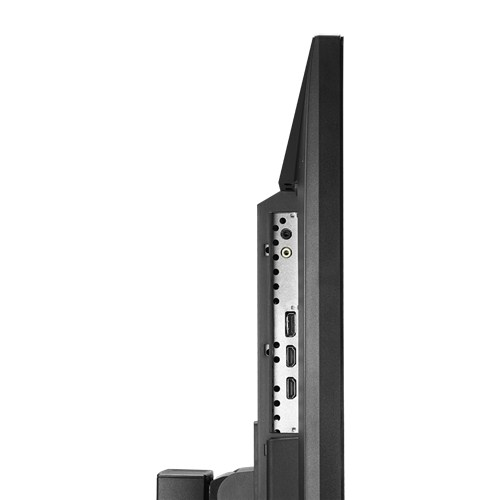 The Asus PB287Q 4K display includes 2 HDMI 1.4 ports and one DisplayPort 1.2, but it lacks a USB hub. On the downside, the PB287Q lacks a USB hub, which can be convenient for connecting peripherals, and its on-screen menu system is clunky. Six dots and a power icon printed on the lower right-hand side of the screen are meant to guide you when using the physical buttons located on the back of the display. I found myself hitting the wrong button and cursing more often than not. Frequently the menu timed out as I fiddled around trying to hit the right combination of keys. You use those menus to access the brightness, color settings, speaker volume, and eight SplendidPlus display modes. These include Reading, Theater, sRGB, Game, and Standard modes. I found the Standard mode setting to be the best option for the tests I ran. 4K monitors provide four times as many pixels as standard 1080 HD displays and require some serious graphics horsepower to run at full resolution and standard refresh rates. The PB287Q can run at 60Hz when connected to a compatible graphics card using DisplayPort 1.2. Refresh rates are limited to 30Hz when using HDMI 1.4. When running at 30Hz, you can almost feel the cursor drag across the screen. Playing games at 60Hz over DisplayPort 1.2 seemed smooth enough, though, and I'll attribute any lag I might have seen to the graphics card's struggles to support that high resolution. 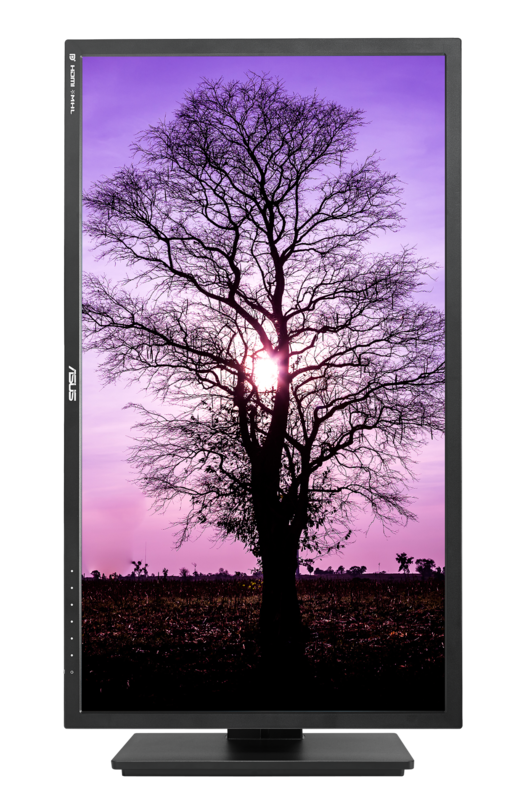 The PB287Q can pivot into portrait mode. Apple’s 4K support extends only to recent MacBook Pros and the new Mac Pros. OS X 10.9.3 dramatically improves the look of UHD monitors running in both native and scaled resolution modes, but many applications are still not optimized. At full resolution, icons and menu text are tiny. You can increase text size and icon size easily enough, but many times I found my aging eyes squinting at itty-bitty text. 4K support on PC graphics cards is more common, thankfully. Windows 8.1 does a good job of displaying its icons, menus and other screen elements at reasonable sizes, regardless of the resolution setting. That’s nice, but how did the display perform? Unfortunately, I wasn’t able to get my hands on the new 4K displays from Samsung (model U28D590D) or Dell (model P2815Q), so I had to compare the Asus to the much more expensive Sharp PN-K321. Compared to the Sharp, and its IGZO screen, the PB287Q has a limited angle of view. Colors shift as you move left, right, up or down from center. The Sharp's color remained consistent even when viewed at extreme angles. Text on the Asus had a grainy, slightly broken look to it, as if some pixels were missing. It looked better when viewed from a bit of a distance, but it was never as clean as the text on the Sharp display. The 31.5-inch Sharp has a pixel density of 140 ppi, and the Asus, 157ppi. That increased pixel density makes icons and screen elements appear smaller, which is more of a problem at very high resolutions. Looking at some test photos, the colors on the Asus were a little muted compared to the Sharp's, but again, the PB287Q costs one-fifth as much as the PN-K321. If you absolutely need an Ultra HD display to view large images or to work on 4K video, the Asus PB287Q is an affordable, serviceable option. It works best with a DisplayPort 1.2, so make sure that your existing hardware is compatible. If you absolutely need an Ultra HD display to view large images or to work on 4K video, the Asus PB287Q is an affordable, serviceable option.